Identity is an incredibly complex concept. Each and every one of us is shaped by a myriad of different identities—individual and personal identities, such as the sports and foods that we like, and group identities, which can be related to different sports teams, non-profit organizations we volunteer for, or parties we support. We may prioritize some of these identities over others, but ultimately, each individual is a mosaic of the different things she identifies with. Most of those identities are based on one’s own choice, some on one’s upbringing and socialization, and some of them one is just born into. Recent discourses on race and immigration in the United States involve highly salient identities, which are ascribed to individuals not based on choice, but based on their skin color or ethnic heritage, and based on the country they and/or their parents were born into. Many immigrants must negotiate both national difference, which may come with linguistic and cultural and possibly religious differences, as well as a different ethnicity in their lives in a new country. For immigrants of the second generation, this can often be particularly challenging. They often find themselves in a place that is “neither here nor there”—somewhere between the identities and cultural values of the country their parents immigrated from and the country of immigration, where they grew up. A racial, ethnic, or religious identity that is visibly different from the mainstream may lead to additional complications. Turkish Germans of the second generation, for instance, often grow up with their parents’ longing for “home.” They spend summer vacations in Turkey, visit relatives, and hear stories of how life used to be before immigration. But in many cases, they do not have any experience with the daily routine of life in Turkey. They speak mostly German outside the home, and even if they are bilingual they are often recognized as “Germans” when they travel to Turkey. On the other hand, even if they were born in Germany, hold German citizenship, and speak German with native fluency, certain “ethnic markers” such as a Turkish name or darker hair and skin make them permanent “Turks” in Germany. On top of that, the stigma of religion can add an additional layer of “difference” for Turkish Germans: In the same way that Mexican Americans have to fight the cliché of being called “illegals” and “wetbacks” (regardless of their true immigration history), Turkish Germans are often categorically labeled as “Muslim.” This means that Turkish identity in Germany is often associated with negative stereotypes about Islam, such as forced marriages and honor killings. 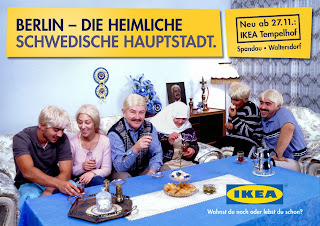 A 2003 advertisement by IKEA in Berlin shows a group of Turkish people with fake blonde hair. The subtitle, in German: "Berlin, the secret Swedish capital." Within the urban environment, this feeling of alienation can be remedied to a certain extent. 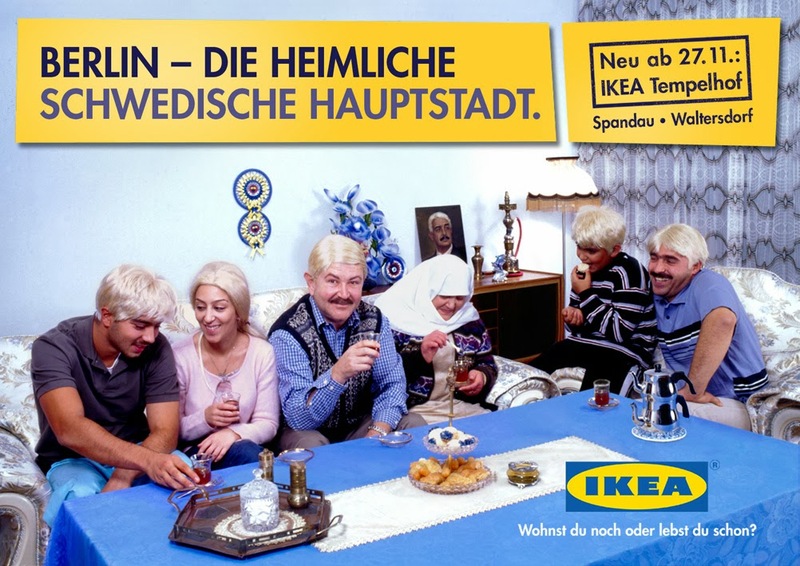 The urban space of the immigrant enclave, for instance, can reflect the duality or conflict in identity that many Turkish Germans of the second generation experience in their daily lives. Within the immigrant neighborhood, immigrants’ visible markers of difference disappear. Here, they are neither yabancı (foreigners) nor almancı (Germans). Instead, the can live their hybrid identity without seeming different or out of place. My second-generation Turkish German interviewees often didn’t identify themselves as “German” or “Turkish,” regardless of their nationality on paper. On the contrary, they identified themselves as “Berliners,” or as “Kreuzbergers.” Their locality, their particular living space became their chosen identity marker in place of any national identity. In the case of Turkish Germans, the process of incorporation into German society and German life is closely tied to—or even dependent on—the neighborhood. Deniz encountered a fate "like many of her immigrant classmates in Germany’s rigidly tracked education system: her teachers channeled her into a non-collegetrack high school, a decision her parents could have protested successfully if they had been familiar with the system. Deniz’s goal was always to study law at university. She tried to get her teachers to provide her with the recommendation needed to transfer to the Realschule and from there to the college-track high school, the Gymnasium, to obtain a university entry diploma. However, every year she tried to get the recommendation, her teachers refused, arguing that her German was not good enough. When I spoke to Deniz, her German was perfect and accent-free, and I would not have been able to tell her language skills from that of a native German. Finally, Deniz graduated the Hauptschule. The teacher wrote on her diploma that Deniz could not be recommended to move up to a Realschule or a Gymnasium because her German language skills were inadequate for the material taught in these academically more demanding schools. Frustrated and angry, Deniz decided to go a different route. She moved to Istanbul and enrolled as a nondegree student at a German Gymnasium there. She took a regular course load and did so well that after one year, her German teachers in Istanbul wrote her letters of recommendation for the Gymnasium in her German hometown, asking the school to allow Deniz to enroll. In response, the principal of the Gymnasium in her hometown told her that he would let her enroll, but that he did not think she was going to make it even through the first year. Contrary to his predictions, Deniz graduated and went on to law school. At the time of the interview, she was in her final years of law school and has since graduated. 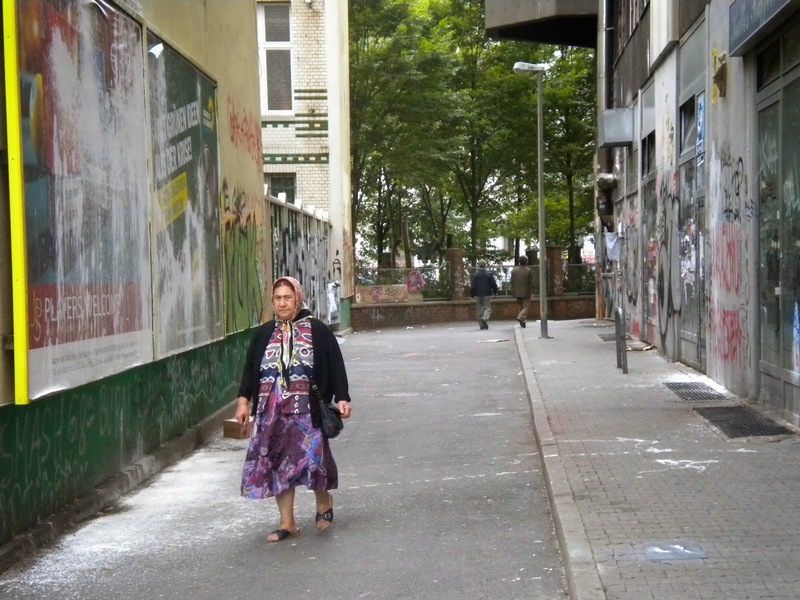 However, her identity as a Turkish immigrant in Germany, as well as her identification with the country, was deeply affected by this negative experience. 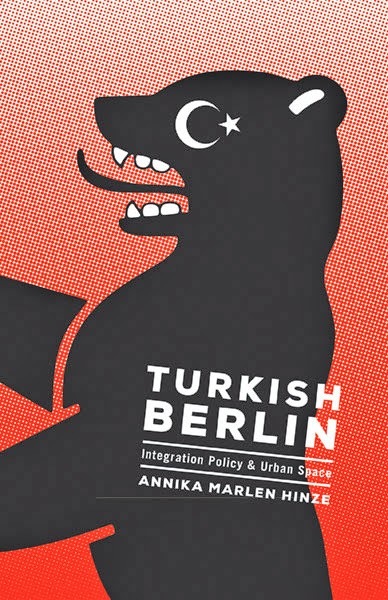 Annike Hinze is author of Turkish Berlin: Integration Policy and Urban Space. She is assistant professor of political science at Fordham University. "Turkish Berlin goes beyond the broad generalizations in immigrant integration debates by digging into what officials actually mean as they operationalize the term ‘integration’ and how the subjects of the resulting policy, Turkish-origin women in Berlin, understand the treatment they receive. Full of rich ethnographic material, this is a fine book that readers will ponder for a long time." While incidents of honor killings are known to have taken place within the Turkish-German community, they remain rare at best. Ironically, one of the most prominent honor killing in Germany was the murder of Hatun Sürücü, who was of Kurdish ethnic background. Her family had immigrated to Germany in the 1970s, and she was born in Germany. She was forced into marriage at 16 and had a son, but left her husband the following year (1999), took off her headscarf and went back to school, raising her son as a single working mother. In 2005, she was killed at a bus stop in Berlin by three shots to the head. Subsequently, her three brothers were prosecuted in her case. Eventually, the youngest of her three brothers, Ayhan, confessed to the killing. The case was widely popularized in the German media. Hinze, Annika Marlen. 2013. Turkish Berlin: Integration Policy & Urban Space. Minneapolis: University of Minnesota Press. Kreuzberg is an inner-city neighborhood in Berlin. It is famous for its multicultural vibe, and many Turkish Germans originally resided here. 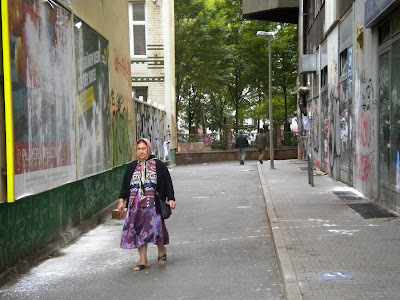 These days, Kreuzberg is massively gentrifying, making it more difficult for many original German Turkish residents to remain in the neighborhood. Kasinitz, Philip; John H. Mollenkopf, Mary C. Waters, Jennifer Holdaway. 2008. Inheriting the City: The Children of Immigrants Come of Age. Russell Sage Foundation. The German school system is divided into different tiers: Hauptschule, Realschule, Gymnasium. The Hauptschule provides a basic educational training for those students who will go into purely practical professions. The Realschule provides a higher-level educational training for students who will likely move into an apprenticeship after graduation and learn a profession. Both, the Hauptschule and the Realschule end after grade 10. The Gymnasium is the only type of school, which grants a certificate that allows its holder to enter university. Its orientation is very academic, and students graduate (depending on which German state they live in) after grade 12 or grade 13. Since the 1970s, there has also been a Gesamtschule (comprehensive school), in which all three types of schools are combined in order to prevent strict academic segregation. One of the biggest criticisms of this system has been the very early selection of students into the different types of schools. Recommendations are made by a student's two main teachers after the completion of grade 6. These recommendations are not binding (and can be overruled by the parents) but they will be taken into consideration by the admissions committees of many schools. This very complicated system often presents immigrant parents, who are unfamiliar with its intricacies and do not speak the language properly, with a huge challenge. Subsequently, they often do not try to overrule the teacher recommendations, which, as in Deniz' case, condemns students to a non-academic career very early on in life. Furthermore, the academic sorting mechanism of the German three-tier school system has been criticized to be discriminatory towards students of non-German ethnic backgrounds, as in Deniz' story. Nice article. I like your books very much.